← Can writing be taught? I am absolutely thrilled with the cover of The Daedalus Incident. Sparth‘s artwork is fantastic, and the layout and typography arranged by Night Shade Books is lovely. Honestly, I wouldn’t change a thing. It’s perfect. But then I found the Pulp-O-Mizer, which allows you to create custom covers that hearken back to 1930s pulp magazines. And,well, I had to. I just…had to. So…behold! 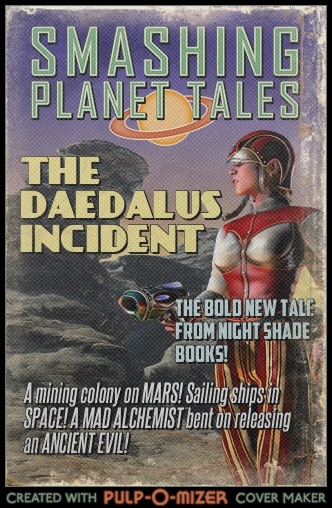 The Daedalus Incident: Pulp remix! Oh, I doubt this is the only time the pulp remix will make an appearance! I must admit the cover you created looks great!